Batini barley landraces from Oman are thought to exhibit salinity tolerance because of their wide cultivation in several salt affected areas. This field study evaluated the biomass and grain yields of 21 Batini landraces and 4 breeding lines from an international collection over three cropping seasons under three irrigation water salinity levels corresponding to electrical conductivities of 2, 8 and 14 dS m- 1. These entries were selected from larger collections based on previous evaluations. Biomass and grain yields were 6.06 and 1.99 t ha-1, respectively, averaged across all salinity levels, with regression coefficients ranging between -0.01 and -0.2. 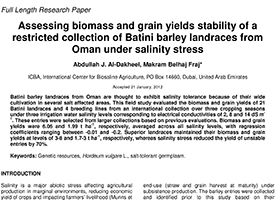 Superior landraces maintained their biomass and grain yields at levels of 3-8 and 1.7-3 t ha-1, respectively, whereas salinity stress reduced the yield of unstable entries by 70%.